Proudly meat free. Satisfyingly simple. High in protein and fibre. 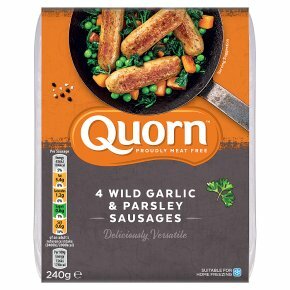 Vegetarian Society approved.A succulent Quorn Sausage infused with the flavours of wild garlic and parsley. These vegetarian sausages are delicious served up with fluffy mash and onion gravy as a dinner time treat. 12 minPreheat 1 tbsp of oil. Fry over a medium heat, turning frequently. 15 minPreheat oven to 200ºC/Fan 180ºC/Gas 6. Brush with a little oil. Place on a baking tray. Cook on the middle shelf.